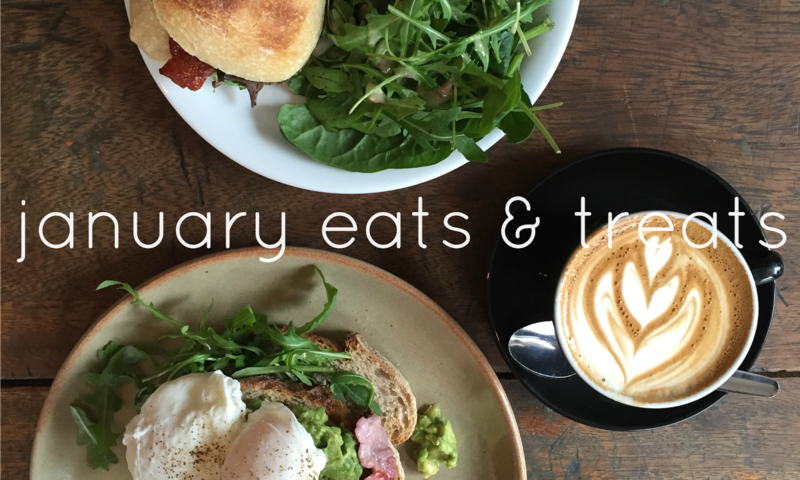 Haven't I been neglecting the 'Eats and Treats' bit of my blog title? Almost 80% of my blog posts are fashion-related, and the other 20% involve random baking experiments and events I've been invited to. 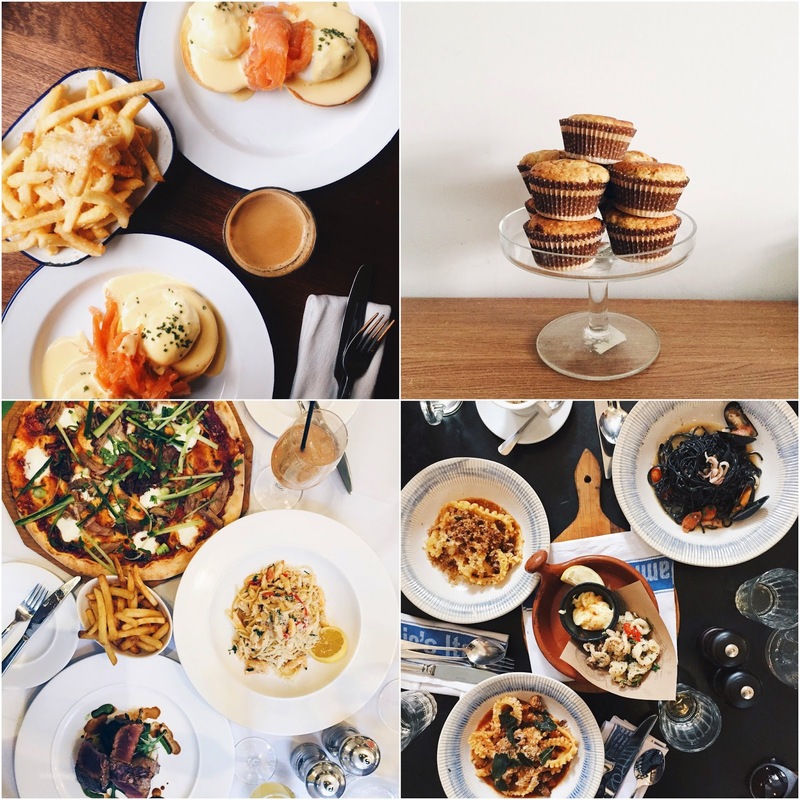 Nothing very concrete about food, which I am admittedly obsessed about! 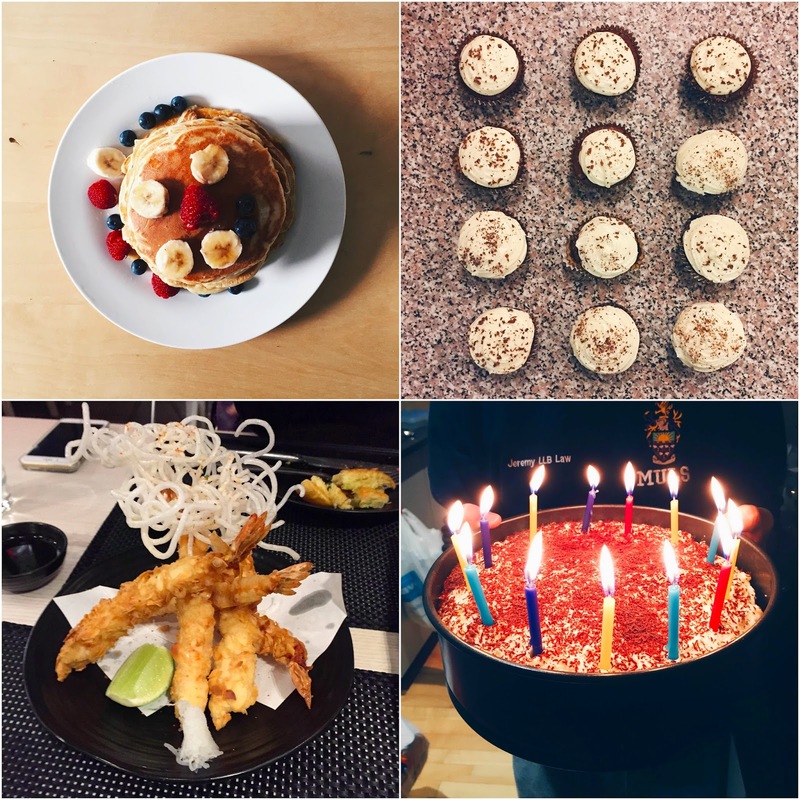 So here's something new that I've decided to commit to - every month, I'll do a round-up of my baking, cooking and other culinary adventures, including café and restaurant reviews! I think this is a step out of my comfort zone, since (for once) it's nothing to do with fashion, and I do believe expanding the content I write about will help my blog mature and grow. American-style fluffy pancakes with fresh fruit and drizzled with maple syrup. If I remember correctly, my two best friends and I made these after a post-exam celebratory night out + sleepover. These are so ridiculously easy to make, just make sure that you use a non-stick pan and/or plenty of cooking oil! Tip: store any leftover batter in a squirt bottle (I use an old ketchup bottle) to fry up a quick snack when you're feeling peckish for something sweet. Hummingbird Bakery's red velvet cupcakes with cream cheese frosting. These were unfortunately an epic fail - my flatmate and I had all the necessary ingredients as required by the recipe book, but ran out of red food colouring! The batter was nowhere near the colour we needed, so I advise anyone making them to stock-up on good quality red food colouring. We used one from Aldi or Asda, and I really don't recommend getting that - we were really disappointed with the result and aggressively brown batter, especially since they were for a friend's potluck party. Cappuccino cheesecake. January seems to be the month of all my culinary failures! As you can see from the photo, this was a birthday cake for one of my closest friends (and biggest, but honest, food critics), so there was extra pressure to make it absolutely perfect. My flatmate and I had a couple of issues with the time it took to bake it, and completely misread the instructions such that we were left with hardly any time to refrigerate it to let it set. *facepalms* If our oven/springform tin had cooperated, and we had sufficient time to let it set in the fridge, I do think that this cake would have been a smash hit! Sakana Restaurant. The Singapore Society of my uni, of which I am a member, managed to secure its members a 30% discount for the month of January on all a la carte items. My fellow foodie friend and I immediately made plans to try out the Japanese cuisine it offers, and although the service and ambience were great, I found the food greatly wanting. I have really high expectations for my Japanese food, and this just missed the mark - the wagyu sliders weren't tender enough, the sushi lukewarm, the tempura too oily... The only thing I would go back for is the molasses tart dessert. Gorilla. I'm a big fan of this restaurant for its truffle fries (TRUFFLE FRIES), coffee and lamb burger. It's right smack in the city centre and just round the corner from my house, so it makes for a convenient but worthwhile venue for a meal. White chocolate and cranberry muffins. Like I said, January was not a good month for my baking. These were too light and airy, not like the dense and moist muffins I prefer. I'm not quite sure where I went wrong, but needless to say I won't be making these any time soon. Jamie's Italian. Italian food is not exactly my favourite (give me Chinese any day). However, I really enjoyed my experience at Jamie's, with its beautiful décor. I had the special of the day (lamb in red wine sauce pasta) in a smaller size, and my friends and I had calamari to share. I loved the pasta, but not the calamari, which I found too oily and not very value-for-money. Still, not bad for a girl who disliked pasta before coming to the UK! Gusto. I had an amazing meal at Gusto Deansgate, which opened fairly recently - everyone needs to try it at least once! I was lucky enough to snag a 50% discount on all food items, so my friends and I splurged on the more pricey items on the menu. Their tuna was fantastic, and I really liked the crab pasta and duck pizza my companions had. We also had a couple of drinks - mine was the pineapple Bellini, which was not too strong and very fruity. The restaurant is also styled to look like the kinds of bars old Hollywood stars would lounge around in, sipping cocktails and smoking cigars. The Gusto website even references Zelda Fitzgerald, an icon of the roaring twenties. I absolutely loved it! Your blog is beautiful !! I now need to go and eat a lot of meat and a cappuccino cheesecake... Will be trying Gusto on your recommendation, thanks. I'm not keen on italian either, went to jamies and accidentally ordered the polenta chips.. They were not nice!